Transparency is important to us, and it is even more because we have the support from many of you, so we will try to keep you posted here on our blog with the latest updates about us! On the highlights, we’ve been busy traveling and connecting to other makerspaces and fablabs in the region. We have been working to launch our “professional services”: 3D printing (we 3D model and 3d print for you), prototyping (we prototype your idea for you) and fabsourcing (we buy for you what you need). More about this soon, as we update our website with what we plan to offer! The renovation of the space is well underway, although delayed by a few weeks. We could afford to renovate the full space thanks to the money from 3 investors. We are technically taking a loan that we will reimburse starting from next year based on the money we make (that is called Revenue Based Finance). Sustainability is one of the key challenge for fablabs, so we have taken the path to develop Fablab Saigon as a social business. We tried to be realistic about how much we could borrow and will be using crowdfunding for bigger projects and activities, such as the participation to the FAN2 conference. Our challenge is to create enough value that is worth paying for, and use the money we make to fulfill our purpose: empower a vibrant community of makers in Saigon in an accessible, diverse and sustainable way. Coming next is our soft launch in July and official launch (some time in August). Also we look forward to connect with fablabs all over the world at the Fab11 conference thanks to Lam, from Fablab Hanoi. We’ll be working too with PAP Electronic and Everest Education on their Summer camp. If you want to help us: we are actively looking for a Fab Cafe manager! We also need the following equipment: PCs for 3D modeling, fridge and freezer, desk and chairs for the co-working space. Donations or second hand, any suggestion is more than welcome! So here we are, we just started the renovation of our space! We have been working on this plan for months now, pushing it back since the Tet (february 2015). On this occasion, I want to share with you the story of the mastermind behind it, Xuan, and give you an update on our plans. Xuan is a good friend of mine, and she’s one of the best hosts I know. At every party I attend at her place everything is taken care of in what seems to be an effortless smile. She has a great eye for details and for practical and beautiful things. So when we were looking for help in renovating the space, we immediately thought about her. Xuan, can you tell us a bit about yourself? I’m Vietnamese and I was lucky to go to France about 10 years ago. I went there initially to study but ended up staying there 10 years. I am passionate about interior design, fashion and gastronomy (French and Vietnamese). Why did you agree to help with this project? I want to help young Vietnamese. 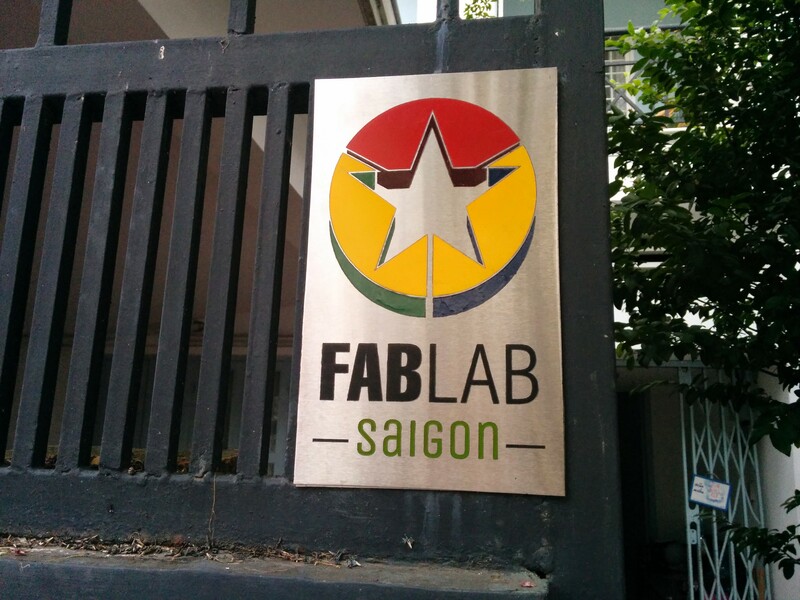 A community space like Fablab Saigon is a space to meet, share and discover. Young Vietnamese can experiment and maybe even find out their calling. Thanks to the technology it gives access to, the Fablab contributes to innovate and create startup and value in Vietnam. The space is naturally divided in 3, which are roughly one floor each. The ground floor is for the Makers to work on prototyping projects (3d printing, workbench, soldering, etc.) with a display area to showcase work done at Fablab Saigon. The first floor is the cafe, a pleasant space to chat and enjoy fresh dishes prepared from the kitchen. The 2nd floor will be divied into co-working space to host visitors, partners and startups who would need a fully functional working desk. For the decoration, we want to recycle as much as possible and use natural material. The roof top terrasse will as a matter of fact be dedicated to nature and gardening. What do you look the most forward to with this project? I really look forward to the intense discussions between young people and makers. I look forward to taking part in discovery workshops and to celebrating the success of the first startups which will emerge from Fablab Saigon. Thank you again a lot Xuan with your help and hardwork on renovating the space. And let’s meet again when the renovation is over! Last week, I attended the Vietnam Engineering Education Conference (VEEC 2015) in Danang. As a co-founder of Fablab Saigon, I was invited to share my view on the Makers Movement and what it means for the next generation of engineers in Vietnam. This is the second part of the article on makers in Bangkok (see part 1 here). I was quite lucky that the 2 spaces I found were pretty close to my hotel in the east part of Bangkok. 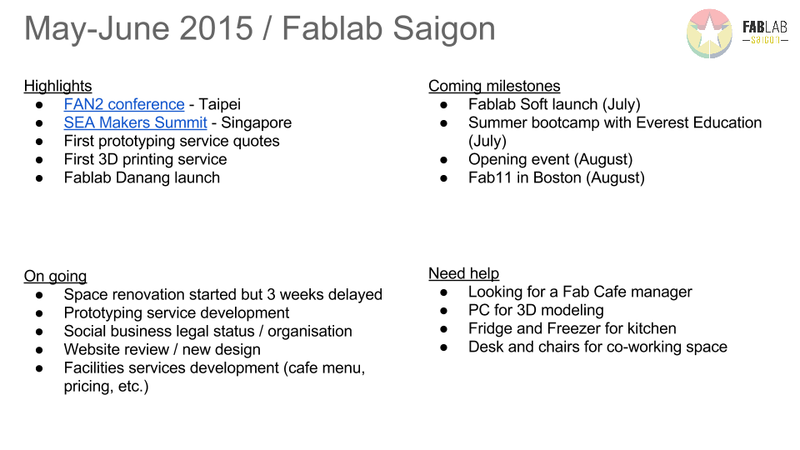 One that I missed but will try to meet next time I’m in Bangkok is fablab@school. The previous article was about Maker Zoo. 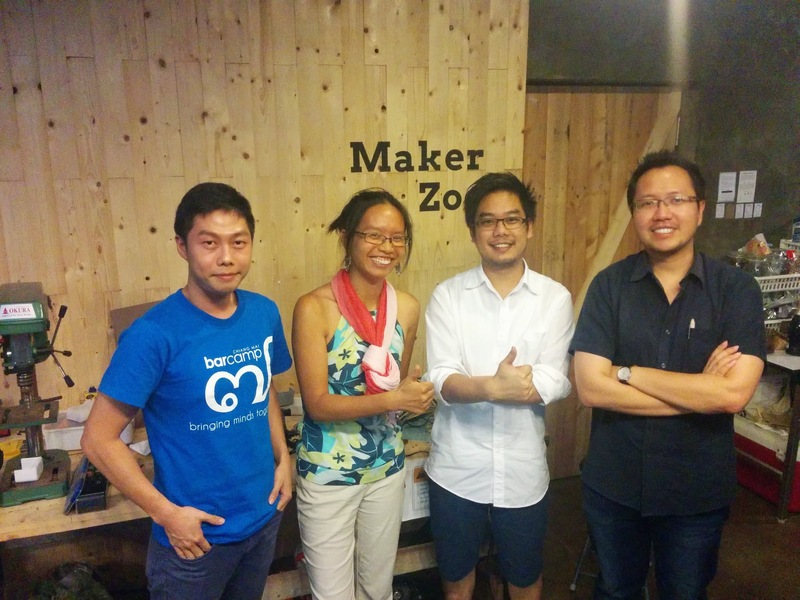 This article is about Makerspace Bangkok. Last week, I went to Bangkok for a few days. And instead of visiting temples, I went to visit 2 makerspaces. A nice way to combine leisure and work. As people say, when you do what you love, should you still call it work? This first article is about Maker Zoo. Next article will be about Makerspace Bangkok. Starting from October 2014, the Fablab is open on Tuesdays, Thursdays and Saturdays, from noon to 8pm. Bắt đầu từ tháng 10 2014, fablab sẽ bắt đầu hoạt động hàng tuần vào các ngày 3 – 5 -7, từ 12g trưa đến 8g tối. 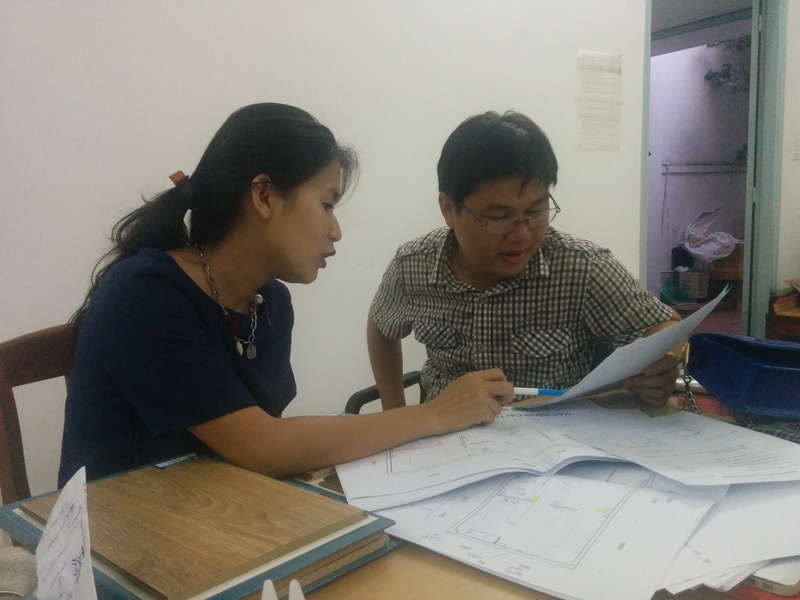 Last week, the Fablab Saigon team went to visit M. Tuấn from the An Phu earthworm farm. 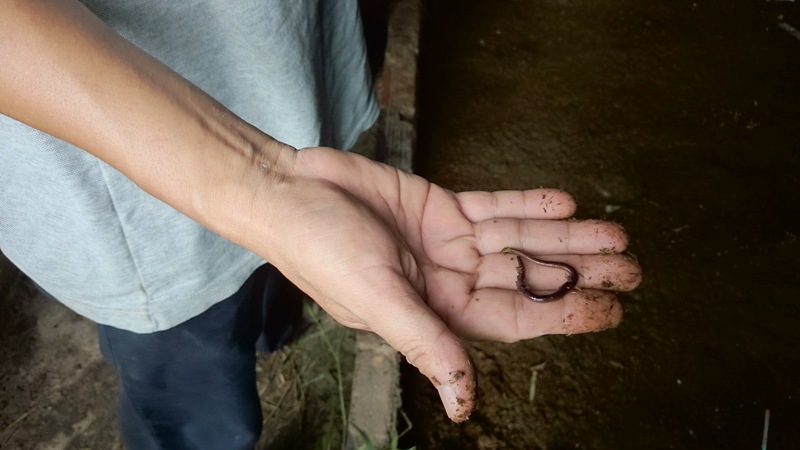 there are quite a lot of information on his website already, but nothing is like going there, see and, for the most daring, touch the worms and have M. Tuấn telling his story. While you can already follow the Fablab activities on Facebook, through our page and our group, we also want to share with you our adventure in more details on this blog. A space where we can write the stories that hopefully will remain and that when put together will be the story of the Fablab Saigon and give it all its meaning: people, projects, events, etc.